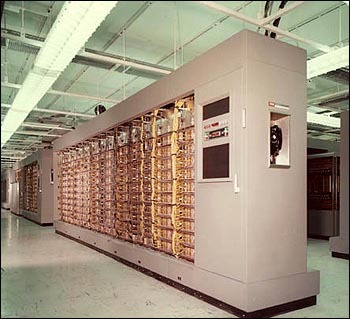 The AN/FSQ-7 was by far the largest computer ever built, and is expected to hold that record. It consisted of two complete Whirlwind II computers installed in a 4-story building (See the impressive diagram in the 'More Pictures' section). Each AN/FSQ supported more than 100 users. IBM had about 60 employees at each site for round-the-clock maintenance. Keeping one unit operating and one on hot standby (to allow for switchover when vacuum tubes failed) resulted in better than 99% uptime. The roles of the two units were reversed at regular intervals, allowing diagnostics and maintenance to be carried out on the standby unit. There were usually several hundred tube failures each day, replaced by workers racing up and down the tube racks with shopping carts full of replacements. Automated tests run by the computer itself would cycle the voltage to the tube racks down and back up to induce marginal tubes to fail early, so that the computer would normally run correctly for the rest of the day. Without this process, the MTBF would have been a few minutes. By the time SAGE was deployed (22 or 23 stations in the period 1959-1963; sources disagree) it was nearly obsolete, since it was designed to detect bombers, not the new ICBMs. Nevertheless it was operational until 1979, when the ROCC (Regional Operations Control Centers) system took over, using much higher-speed computers. One SAGE station continued operating until 1983. This last unit was donated to the Boston Computing Museum, since relocated to Moffett Field in Mountain View, California. The museum also has a tube panel from the Whirlwind I. Whirlwind II consoles turned up in the TV series Battlestar Galactica. � The first in line microfilm fast processed 35 mm projection displays, preceding printer/plotters. A screen capture could be displayed within 30 seconds, � First two-pass assembler, permitting symbolic addresses. The photo (from Mitre) shows the rear panel wiring of FSQ-7 arithmetic element frame. see more IBM AN/FSQ-7 Ebay auctions !